The internet is awash with data. Worse, much of this data is not understood, is poorly analysed and is presented as insight. The combination is dangerous to the average browser, who does not have the time to dig into the facts, as one is likely led to believe something that is far from the truth. Because of the ease with which the internet can present bad data as fact, one must be extremely careful to navigate to sources that are authoritative and thoughtful, those that can be trusted to curate through the junk to find the really fact-based, meaningful and insightful stuff. It can be really disappointing then, when a generally excellent source delivers junk to its readers. 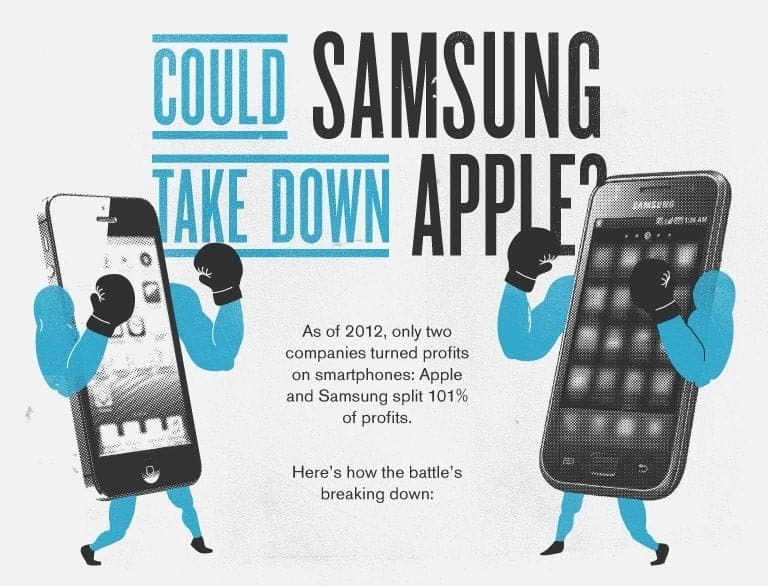 The article is found on the ReadWrite website under the headline: Samsung vs. Apple: Samsung Is Winning Every Way But One, and features an Infographic created by MBAOnline, using data from a variety of generally good sources and used by the author to make his case. Lets separate fact from fiction and dissect what’s wrong with the Infographic and the conclusion reached by the author. Fact? 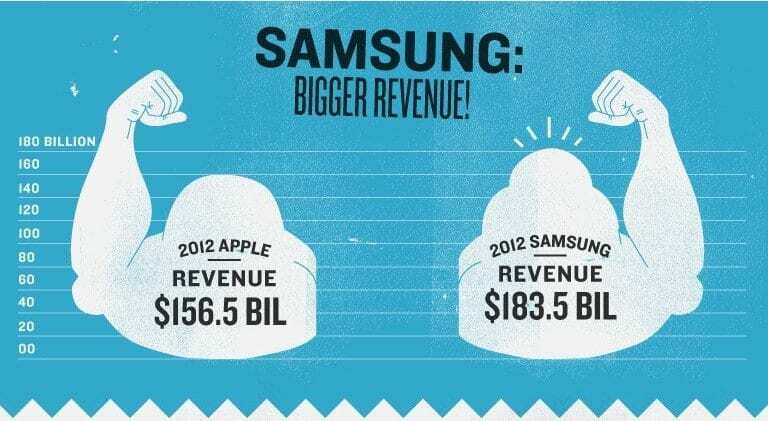 Samsung has bigger revenue than Apple? The first comparison is of the 2012 sales by Samsung of $183.5B and by Apple of $156.5B and rightfully points out that Samsung is bigger. But these companies are in different businesses with an overlap primarily in smartphones and tablets. The comparison should be on those devices only, else it’s a little like comparing Exxon to Apple and trying to draw a conclusion. So what do we know? Apple trounces Samsung in tablet sales. And from the same Zdnet source used by the creators of the infographic, even though Samsung shipped the most phones in the 3rd Quarter of 2012, 66.1 million to Apple’s 45.8M, “Apple led all vendors in value with a total of $34.1 billion”. Incidentally, even the Zdnet source got their headline wrong claiming “Samsung is beating Apple in sales of ‘smart connected devices’”, despite the quote included in their text. Zdnet chose to focus on units sold rather than the more important dollar value of sales. This is like proclaiming Timex is beating Rolex by comparing Timex sales of a larger number of inexpensive watches versus Rolex which even though it sells a smaller number of expensive watches, has a much larger overall sales revenue. Who is leading in sales of comparable products? Apple! Fact? Samsung has bigger employee count. Since when did having more employees make a company better? 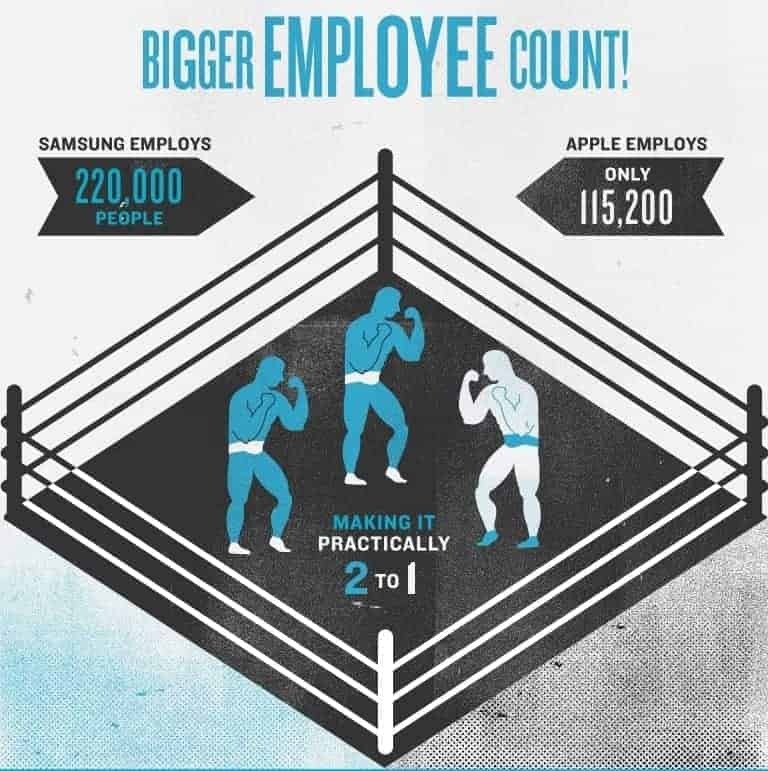 The second comparison proclaims Samsung has the bigger employee count with 220,000 versus Apple 115,200. Leaving aside the obvious flaw, pointed out earlier, in comparing dissimilar businesses, and also disregarding the fact that Apple outsources most of its manufacturing while Samsung has its own factories, the headline is otherwise correct. But why is that so important? Since when did having more employees make you better? Doesn’t the real measure of a company’s prowess have to do with how productive its employees are? And if so, one could use a very simple measure of sales per employee and find Apple 63% higher than Samsung. No, let’s ignore the facts! Fact? Samsung spends more on R&D and Advertising. The third measure boldly proclaims Samsung to be a winner because it spends more than Apple in Research and Development at $10.5B versus $3.4B, and in Advertising of about $3.0B versus Apple’s about $1.0B. Again, ignoring the obvious issue related to the types of businesses, when did spending more in a category actually equate to being better? Isn’t there good and bad advertising and R&D expenditure? 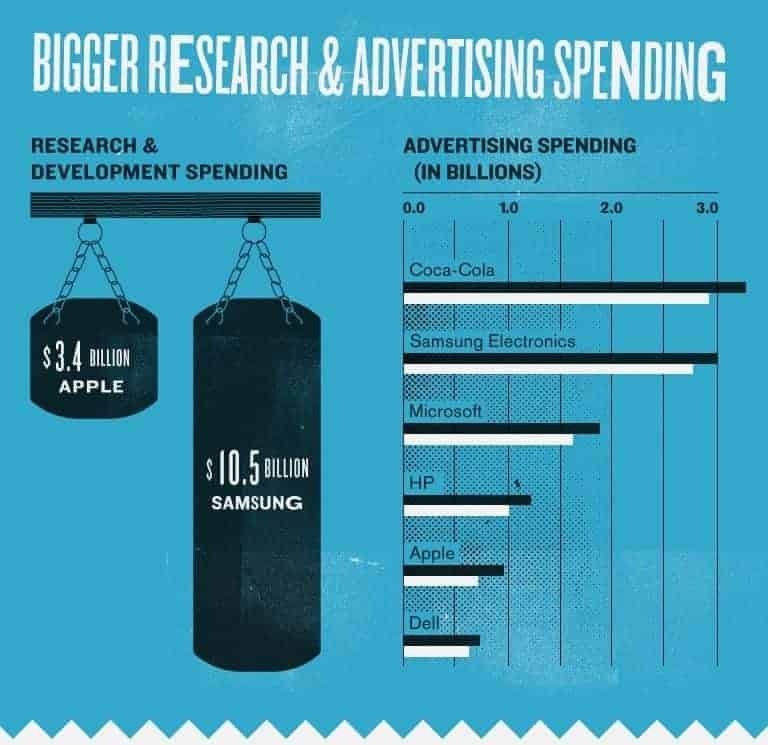 Why for example, with all of that R&D and marketing can’t Samsung get a higher price (due to more innovative features if the R&D was value creating, or brand preference due to creative marketing if that was valuable) or a higher profit (due to cost reductions being driven by innovative R&D) for their comparable products? One should instead be arguing that Apple is getting a better bang for it’s buck with its R&D and advertising expenditure. In fact, it is well known that Apple gets a lot of free press due to their secrecy and loyal following, so maybe they don’t need to advertise as much as Samsung does to have the same effect on the market. Which one is really better? I am going to go with Apple here again. Fact? Apple has greater profit! The next comparison is somewhat goofy. It proclaims rightfully that Apple has the greater profit. Then the creator shows a chart that says for every dollar spent on smartphones, Apple got 43cents, Samsung 36cents etc. So, Apple is getting 43% of the total sales of smartphones. It also has a pie chart which rightly shows Apple with 72% share of handset profits, with Samsung at 29%. Yes, the rest of the industry players combined, lost money selling smartphones in the 4th quarter of 2012. 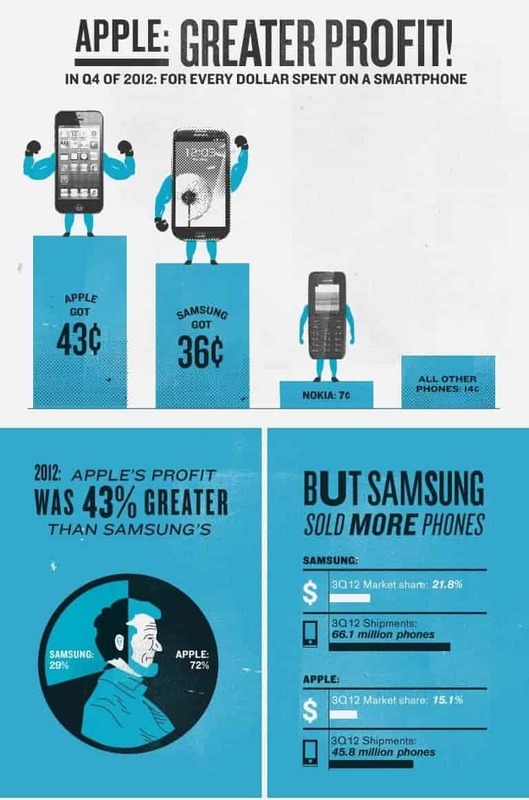 However, the headline for the pie chart says “2012: Apple’s profit was 43% greater than Samsung”. That is wrong, Apple got 43% more of the total smartphone profits than Samsung, but Apple profits were two and a half times Samsung’s, which one would describe as being approximately 150% greater than Samsung’s. The third part of this comparison shows a bar chart with 3rd Quarter numbers, while the other two comparisons were based on 4th Quarter 2012 results. The fourth quarter numbers are easily found in the Fortune article that was used as a source. This is what that article had to say: Apple took home 72% of the profits with only 21.7% of unit sales. This would be considered a knockout by Apple, in any fairly refereed fight. Facts are a pain aren’t they? 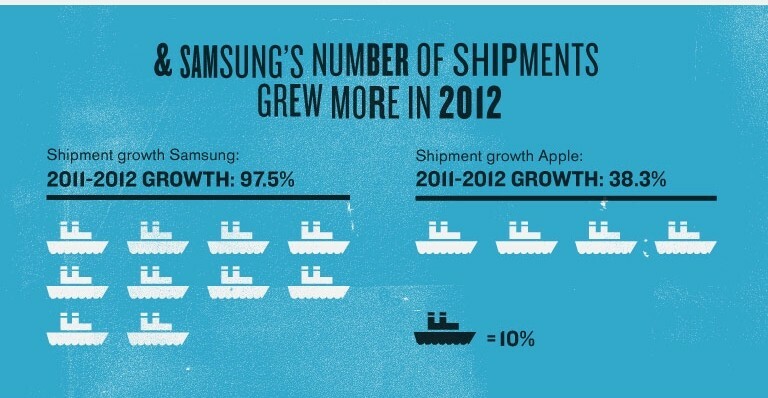 The fifth comparison shows Samsung shipments growing 97.5% in 2012 over 2011, versus Apple’s shipment growth of 38.3% over the same time period. Ok, chalk this one up for Samsung, although I would much prefer analysis of profit growth or just pure profitability. In the 4th quarter of 2012, Apple earned $13.1B on sales of $54.5B, while Samsung earned $8.3B on sales of $52.5B (including all their businesses). By those measures Apple wins on sales and profit. Fact? 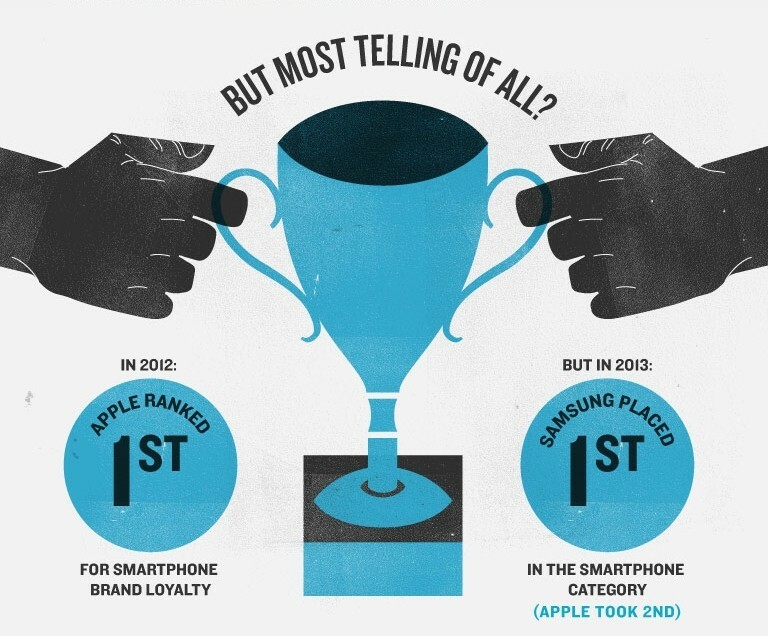 Samsung ranked first in loyalty? Finally, the chart indicates that the most telling win was Samsung moving into the number 1 smartphone brand loyalty position in 2013, over Apple who was the previous leader. It’s simple really. 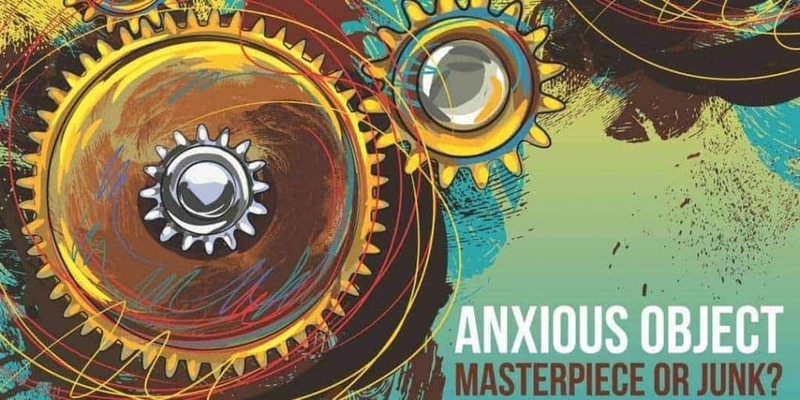 In a world in which well trained curators in museums can be convinced to buy fakes (see here), what should we expect of writers and analysts on the internet, who are either uninterested in facts, or incapable of doing the necessary due diligence before they present findings as insights. Be careful online with what you read, it may have no more substance than bird feed! I agree that there are very few facts in this world. With the summer months drawing to a close, it has been a somewhat warm few months for the stock market with the S&P 500 and Dow recently at record highs.